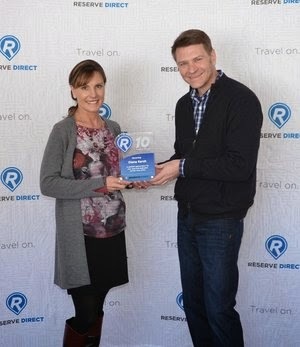 Reserve Direct, a leader in travel reservations and booking solutions for travel suppliers for 13 years, honored Diana Coleman Kersh March 1st for 10 years of service to the company. Diana, Reserve Direct’s Senior Market Manager, started with the company in March of 2004 and is the second employee to reach a ten year work anniversary. Diana started as the Market Manager for Reserve Direct at its first destination in Branson, MO, coming to the job with nearly a decade of experience in the Travel and Tourism Industry. Her industry knowledge and drive made her an integral part of the then-small company. As Reserve Direct grew to include 10 destinations Diana was responsible for training new Market Managers and was an energetic component to the ongoing expansion of the company. Promoted to Senior Market Manager in 2011, Diana now oversees several destinations and Market Managers, providing training, management, and expertise while still serving as the Branson Market Manager. She is an active member in state and local attraction associations in Branson and several other destinations. Reserve Direct congratulates Diana on 10 years of dedicated service. Reserve Direct is a travel reservation technology company that focuses on specific travel destinations, offering local expertise and reservations for shows and attractions, as well as hotel reservations to vacationers, families and businesses. The company also offers fulfillment tools to travel suppliers and other regional travel resources. Reserve Direct provides travel service in a variety of markets like Branson, Missouri; Pigeon Forge and Gatlinburg, Tennessee; Orlando, St. Augustine, Panama City Beach and Destin, Florida; Williamsburg, Virginia; Myrtle Beach, South Carolina and the Hawaiian Islands.